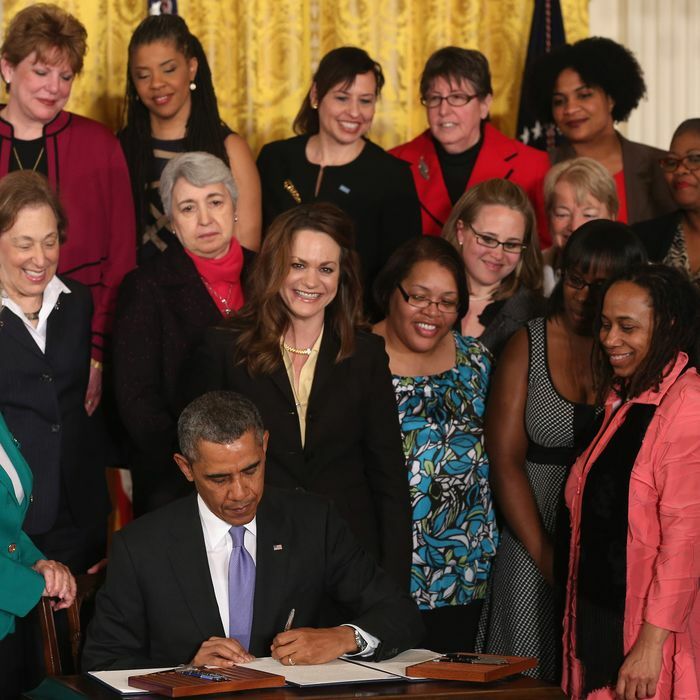 Although the two executive orders signed by President Obama today will “[not] affect the broad American work force,” they did allow him an appearance with Lilly Ledbetter and a gang of other women in the East Room of the White House, where he challenged Republicans to do something that will actually address the wage gap. Others, like the American Enterprise Institute, say the White House is part of the problem, paying women, on average, 88 cents to a man’s dollar. “If Republicans in Congress want to prove me wrong, if they want to show they in fact do care about women being paid the same as men, then show me,” said Obama, who’s now resorting to double-dog dares to get laws passed.